Karlheinz Essl is an Austrian top performer in Electronic music. 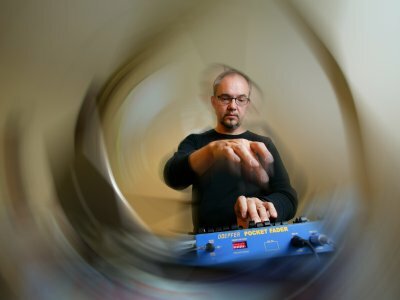 He also does the impossible: composing unending electronic music pieces, writing music samples, creates software for Max/MSP, develops generative sound and video environments and has to power to improvise music over and over again. All this is featured in his music. Essl believes that ecstasy and trance always meant something for him. He tries to feel and share it through his music. To him, "composing is a pain" ; he likes to improvise, for "things can happen that the composer never planned on having." The music is influenced from rock to jazz, and even music from the Renaissance period through to the sounds of computer-generated music. With all this impact, he breaks the normal barriers of a composer. He contradicts the meaning of a music play, what it is, how does it begin, how does it end, and how it must be structured. And amazingly, he does this through the use of MAX/MSP software. The compositions from Essl are widespread and range from instrumental classical music, to mixed forms of live-electronic, to real-time composition and improvisation concepts to sound installations and internet projects. Essl uses m@ze°2 (Modular Algorithmic Zound Environment) - an electronic keyboard instrument he created that allows users to compose and improvise music. It is connected to his RTC-lib (Real-time Composition Library), a Max/MSP software library for his algorithmic compositions. It contains random, harmony, rhythm and structural generators. Most of times, Essl is a composer and performer in public. He believes that in today’s society that musicians are very limited to the composers of the music and the performer of the music. What makes the composer unique is that he should not only be able to compose for himself but also compose music in all categories and for all occasions. Essl has been studying closely to the principles of organization and drama through his music. Some of his works have been commented of being “constructive” from listeners, Essl says "[construction] only helps me get into areas where I would normally not be able to reach." 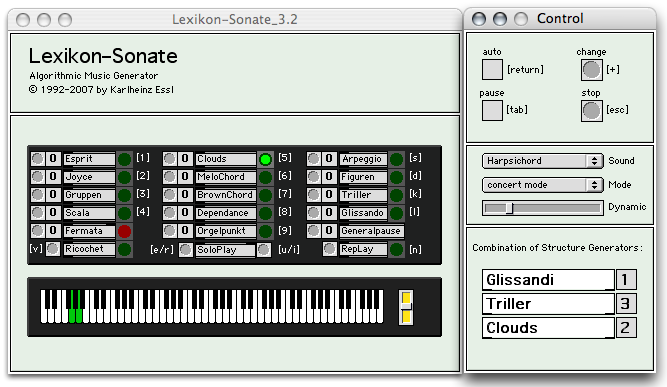 Lexikon-Sonate is a program that composes an endless piano playing piece. Basically, there is no score for the computer to read from, and there is no pianist playing a piano, or a composer to direct it. The algorithm is comprised of "which key should be pressed how quickly and held down for how long" which then directs the piano into playing the note. The goal was to create a program which can compose in real life – synchronous. The user constructs the sound from their own character personalities (personal taste), and henceforth becomes the composer him/herself. He used music gestures from "Bach, Beethoven, Schönberg, Webern, Boulez, Stockhausen and Taylor" and placed them into ‘modules’. These modules are then mixed and a part will be extracted from the piece from different constraints placed on it. The technology he wrote this in was Max/MSP as seen in the image above. There are the structure generators seen on middle left hand side, that controls the melody, chord, texture, repetition and pauses. Lexikon-Sonate is surprising it can create sound from nice soft tones to fast high pitches, varying in volume, pace and style. It is truly amazing that something can be created from a piece of software and sound system that would never repeat itself. It is very humane, yet contains none of the classical composition, for it can be relaxing at one point, but so intense the next. It would definitely have been more interesting if he not only used the piano, but other instruments. Yet even though there is still a limit in the sounds of a keyboard, the variables Essl’s program Lexikon-Sonate can process, is unimaginable. This new work comprises of performances using solo instruments including the flute, clarinet, trumpet, violin, cello, toy piano, e-guitar and voice mixed in with live electronics. The Sequitur program receives the input from the instruments, and differentiates it into eight parts. The random generator plays a different amount of parts each time, at various intervals all random. What is interesting about this is that there are inputs of music, but what comes out as the result is totally different to what was played. The processing is done in real time, with sound transformers altering the sonic shape. The piece Sequitur III for violin and live-electronics begins high pitched the setting for a film - a torturing scene. Then I feel the lost romance in the next tones. At the middle, it sounds like Chinese music for Peking Opera which elevates the mood. It becomes sad, and then the high keys of the piano makes it light again. That was the only instrument I can fully recognized, the process by which the violins and other music go through in Sequitur III it becomes intertwined and mysterious. What is different in their location to our context is that it all seems classical, yet modern without any harsh beats of a drum. Some parts make you tap your feet; other melodies make you concentrate more to the composition of the song. In 2003, he used church bells to create a live performance called Sonnez la cloche!. This piece was performed in Tyrol, Schwaz and he firstly took a sample of the church bells, which then turned it into a never-ending piece. Meanwhile, he varied the sound using his Max/MSP program and waited till the real church bells rang and synchronized his music along with it. An audience member commented that the piece "changed the very Alpine air we breathe" . The sound of Sonnez la cloche! is so complex to figure out, and what Essl has created in his programs are more farfetched than you can imagine. Watch this video to see. Karlheinz Essl performing Sonnez la cloche! Through the Curly Rain Taps is a 2005 generative visual sound installation composed by Karlheinz Essl in collaboration with Ramón Gonzalez-Arroyo. It contains the "collaboration, comination of image and sound, infinte flow, relationship to the work of the two different and similar painters". González-Arroyo provided the real time endless piece of music which were accompanied by real time image processing created by Karlheinz Essl. Panta Rhei is a 2006 generative sound environment for an art installation by Jürgen Messensee. The sounds depict water in its natural course – from destructive waves to the peace and soliloquy of the ocean. This piece is randomly generated with "the rising and falling of the sounds, the glissando movements and the spectral sound shifts are controlled by a time-variant wave model, the parameters of which are constantly changed by random operations." In Panta Rhei, everything is meant to be fluid. From all his works, I realized how nothing is absolutely the same, how electronic sound can be generated, processed and portrayed as an art form.